Can you make a trick with the king? You can try finessing – this doesn’t guarantee that you will win the trick, as you don’t know the distribution of cards between West and East, but it gives you a chance of winning. Finessing means leading a low card towards the honour card (or cards) that you hope to win with. 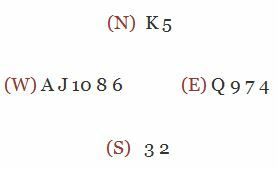 In the example above, you are South and North id dummy. What do you think are your chances of making a trick with the Kind? If you finesse – lead a low card towards the King – you have a 50/50 chance of making the trick. Either East has the Ace or West has the Ace. If East has the Ace your king can’t win as East will keep the Ace until you play the King. What will happen if you lead the King instead of finessing? It will lose, because whoever has the Ace will play it and take the trick.